Not that that is necessarily a bad thing, but Secret Weapon really doesn’t fit within the scope of music that is reviewed on this site. The opening track ‘Alive Again’ sounds most of all like Jon Bon Jovi’s ‘Wanted Dead or Alive’ from 1986, while ‘Hot To Cold’ (which might have been a Bad Company track) is quite a fine rocker and probably the highlight of the album. The second track, ‘Heal the Broken Hearted’, takes us way closer to Gerry Rafferty than the world of rock, and The blues rockers ‘The South Summit’ and ‘I’ve Been Leavin’ You’ feature some nice soloing, but it's still nowhere near the molten metal leads that we get from blues rockers like Lance Lopez, Blindstone Blues Band or Sven Cirnski’s Truth. 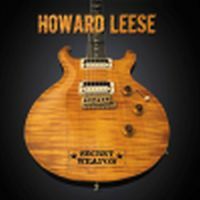 All in all, Howard Leese’s first solo effort is one big hodge-podge of styles ranging from the piano piece ‘French Quarter’ and the west coast tasting ’33 West Street’ to pop ballads like ‘The Vine’, ‘In These Eyes’ and ‘Vermillion Border’. It’s all well executed, but as I said, it has nothing to do with metal and will therefore receive no rating. I will say, however, that most of the tracks strike me as quite bland and uninteresting. If you like 70s stuff, blues or west coast go for the real thing instead of this stunted mixture of styles.